Enjoy your vacation in lakeside luxury at our condominiums on beautiful Castle Rock Lake! 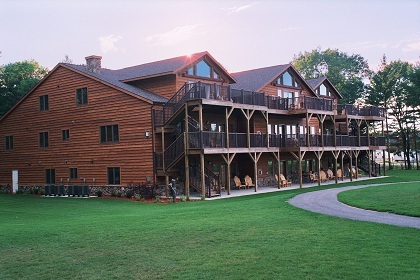 Our luxurious condominiums are constructed of cedar and fieldstone giving you the north woods feel. The spacious interior will leave you breathless, with hickory cabinetry and granite countertops and vanities. Nothing was left to chance, when you walk in, you just know things are as they should be. If luxury is your preference...The Northern Bay Golf Resort and Marina is your resort! 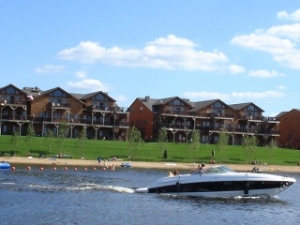 The Northern Bay Golf Resort and Marina is home to more than 200 luxury condo units on the shores of Castle Rock Lake. These privately owned, fully-furnished units can accommodate up to 10 people in one to 4 bedroom floor plans of up to 2,532 square feet. Northern Bay offers numerous floor plans, with your choice of first, second, or third floor and lake or golf views. Each unit offers a full kitchen, washer and dryer, gas fireplace and other luxury amenities. All condominiums have either a patio or wooden deck area to relax in the beauty of The Northern Bay Bay Golf Resort and Marina. All Northern Bay condominiums are spacious enough for the entire family to stay. The Northern Bay Golf Resort & Marina is the ideal place to take your group of 4-400! For Golf Events call our Golf Shop 608-339-2090 option 2 or email golfshop@northernbayresort.com. For Meetings, Retreats, Weddings, Reunions etc, call our Groupe Sales Dept. at 608-339-2090 ext. 7011. All condominiums are privately owned and amenities may vary per condominium. Rental of condominiums may be subject to a Security Deposit. Normal cleaning of the condominium at departure of your stay is included in your rental rate. Pack and Play cribs are available upon request for a minimal fee. Pet friendly units may be available upon request when reservation is made. Cancellation fees apply. $75.00 cancellation fee if reservation is cancelled prior to 14 days of the arrival date. If the reservation is cancelled less than 14 days prior to arrival, the deposit of one night plus tax will be forfeited. Check in time 4:00 p.m., Check out time 11:00 a.m.
View a sample of our floor plans below. This is strictly a sampling of our floor plans. Floor plans may vary. Exact floor plan cannot be guaranteed.